More is being demanded of solar inverters than ever before. Creating a brilliant, cutting-edge piece of equipment at a competitively mandated low price point is an incredible challenge. It’s not for the faint of heart, yet companies like APsystems are thriving in this complicated, demanding crucible of a niche. So how are they doing it? And how does APsystems continue to push the envelope on inverter advancements? Senior Director of Marketing Jason Higginson gives us a peek behind the curtain. 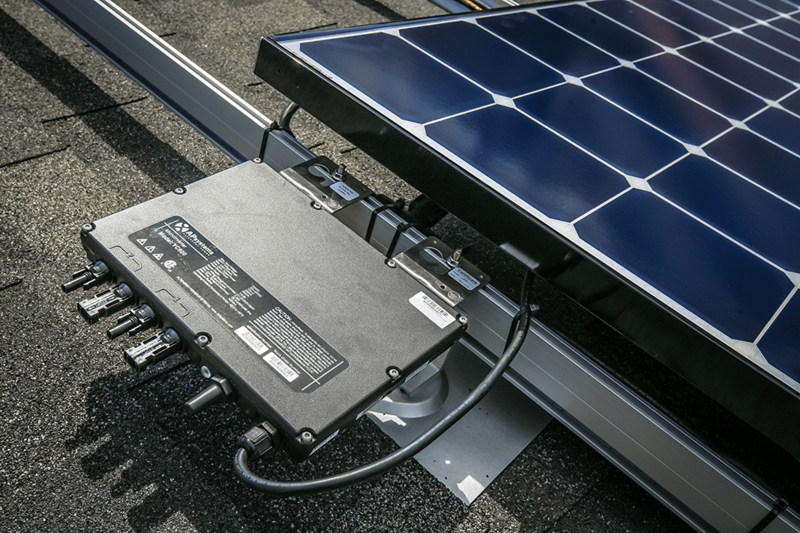 ANAHEIM – September 24th, 2018 – APsystems unveils the QS1, a four-module, single phase microinverter for residential applications at the Solar Power International trade show in Anaheim. 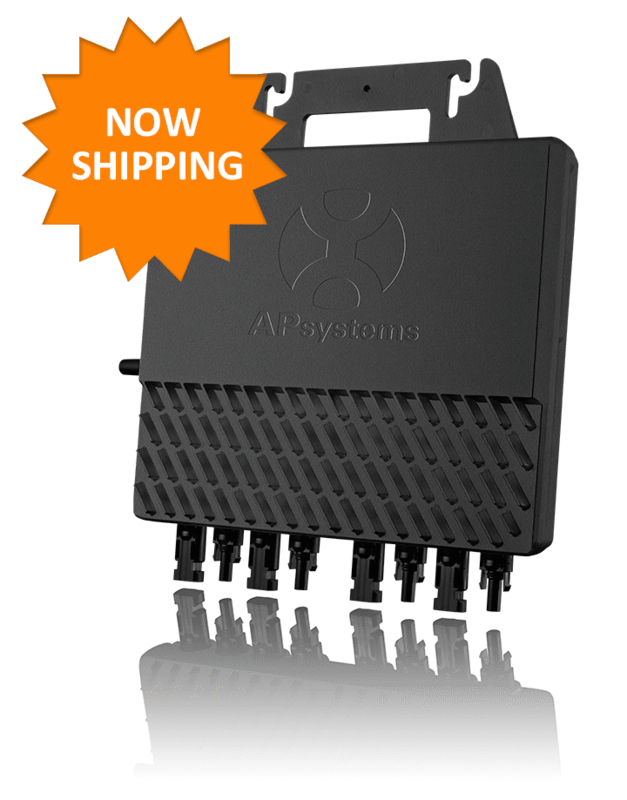 A new design for APsystems, the QS1 offers 75% faster installation time, while offering the highest peak output power and up to 3X faster data transmission speed than PLC. 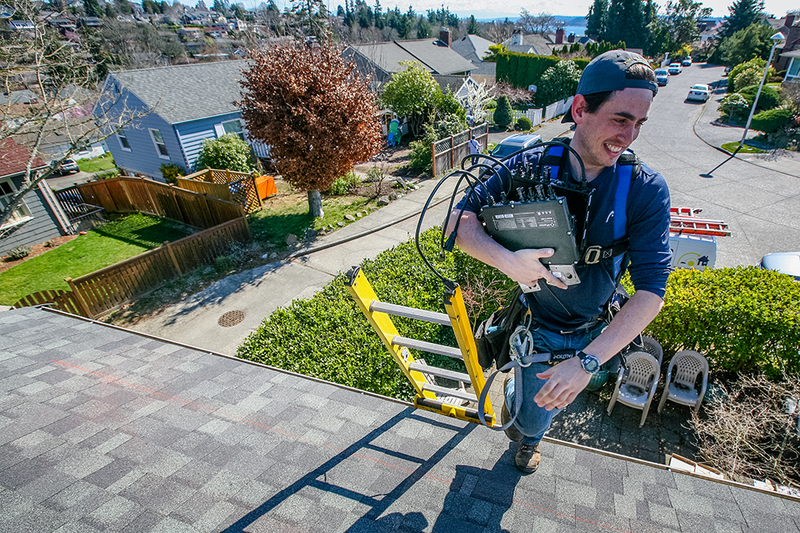 A wider MPPT voltage range will result in a greater energy harvest for homeowners. The first of its kind, the QS1 is designed to accommodate today’s high output PV panels up to 375W, offering 300W AC output per channel, the highest among microinverters. 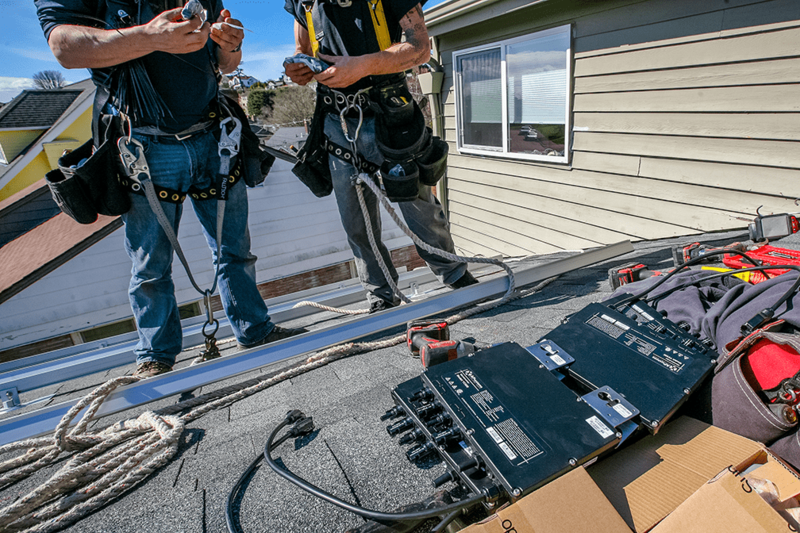 The unit also significantly reduces installation time and costs, taking the place of four conventional microinverters per each QS1 installed while still providing four independent MPPT. The QS1 utilizes a common AC trunk cabling with the dual-module YC600, offering flexible mix-and-match compatibility on the same circuit to enhance site design capability and maximize circuit capacity. 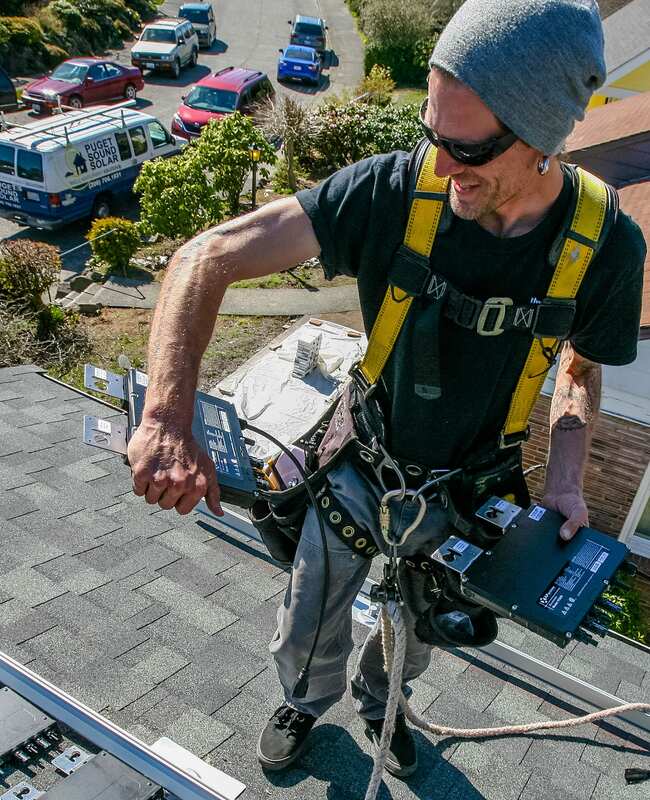 Both microinverters also utilize the same gateways; installers can choose from the ECU-R, for single or multi-residential installations, or the ECU-C, for applications requiring consumption monitoring and advanced contact/relay features. Today’s solar systems require a more robust communication architecture to manage significantly more data points and in-field software updates. A 2.4GHz wireless Zigbee mesh network offers enhanced data transmissions speed, up to three times faster than conventional powerline communication (PLC). The QS1 builds on the successful APsystems line of multi-module microinverters, offering reduced logistics costs, integrated communication and connection features, and a wider MPPT voltage range for greater energy harvest during low light conditions. 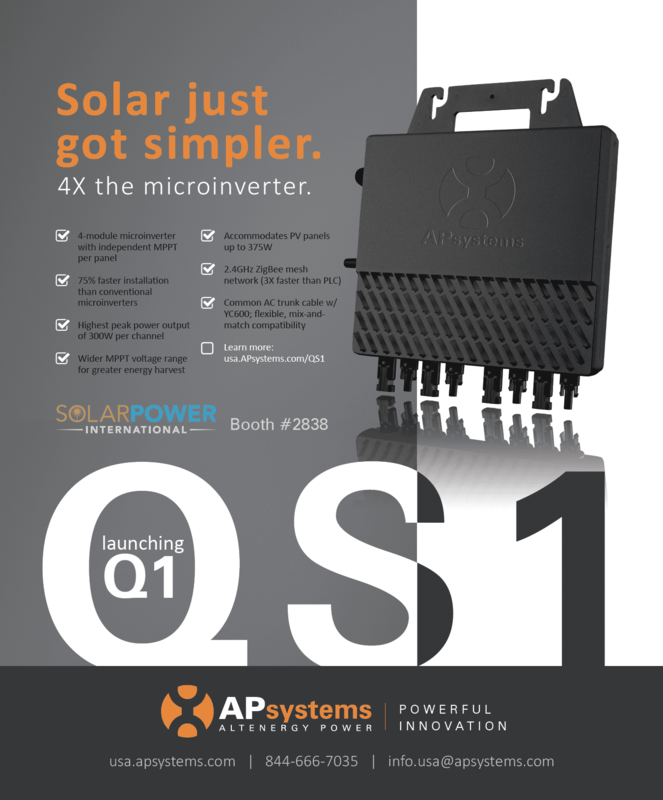 The new microinverter will be on display at the APsystems booth #2838 at Solar Power International. SEATTLE, Wa. ; ROTTERDAM, Netherlands; JIAXING, China – August 27, 2018 – APsystems will unveil the QS1, a four-module, single phase microinverter for residential applications at the Solar Power International trade show in Anaheim. 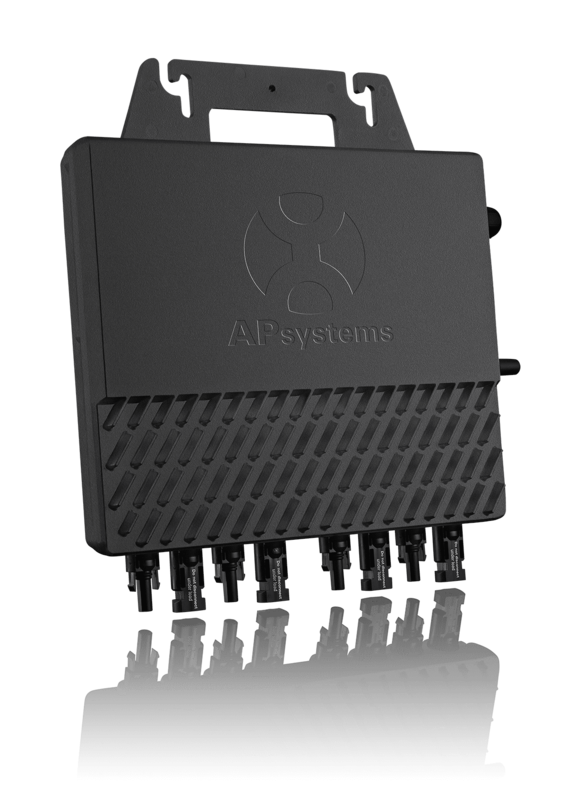 A new design for APsystems, the QS1 offers 75% faster installation time, while offering the highest peak output power and up to 3X faster transmission speed than conventional microinverters. A wider MPPT voltage range will result in a greater energy harvest for homeowners. The first of its kind, the QS1 is designed to accommodate today’s high output PV panels, offer enhanced capability and significantly reduce installation time and costs while providing an unprecedented level of power with four independent MPPT per channel. Common AC trunk cabling with the dual-module YC600, offers flexible mix-and-match compatibility on the same circuit and with the same gateway (ECU-R or ECU-C). 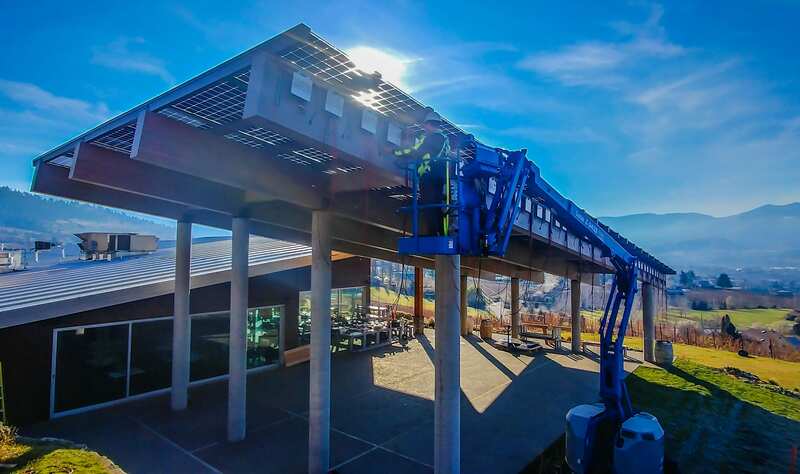 The unit also builds on the successful APsystems line of multi-module microinverters, offering reduced logistics costs and integrated communication and connection features. The new microinverter will debut at the APsystems booth #2838 September 25-27 at SPI. 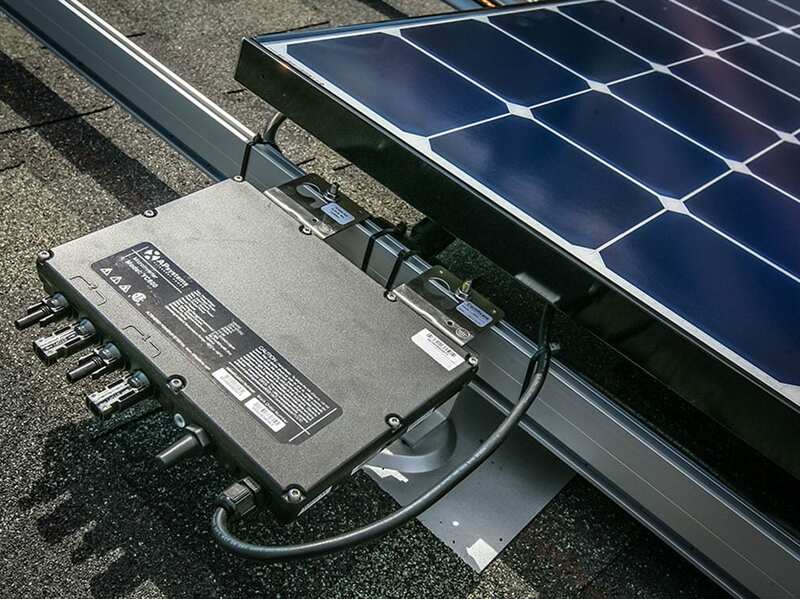 APsystems microinverter reliability is touted in the August issue Solar Power World. 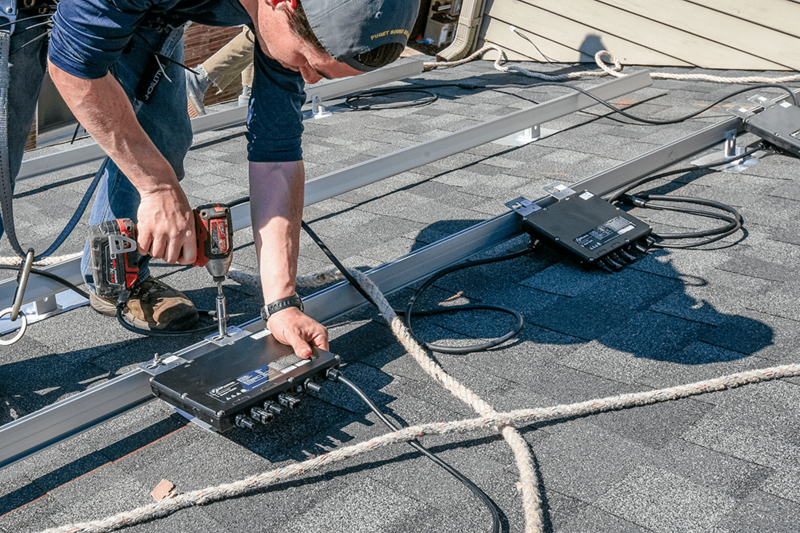 In the article “How should solar installers plan for inverter failure,” writer Kelsey Misbrener explores inverter reliability, warranties, and industry views on how installers and customers can keep up with evolving inverter technologies. 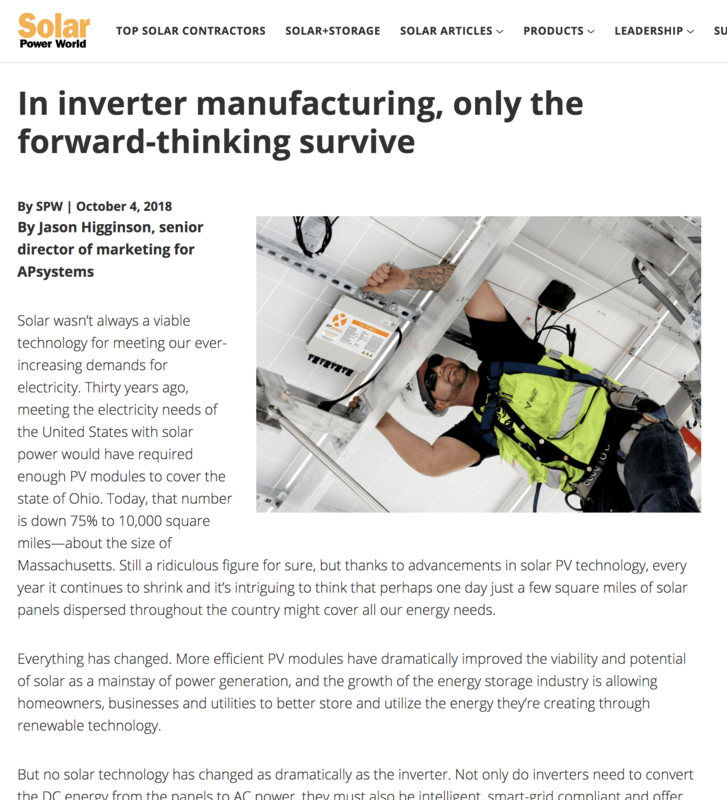 The article quotes Director of Marketing Jason Higginson, citing APsystems microinverters as designed and built for both long life and ready upgrades. 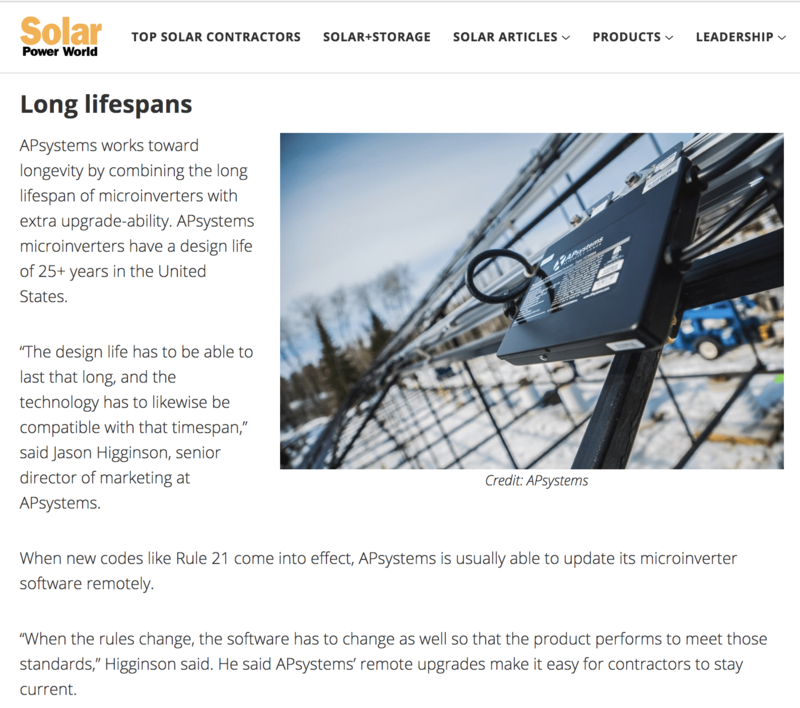 With their software-based design, APsystems microinverters can be upgraded remotely to keep systems current with new technical standards and regulatory requirements. 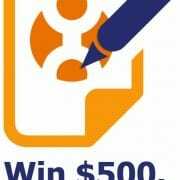 Take our 2018 survey and enter to win $500 cash! Are you an installer, contractor or distributor? 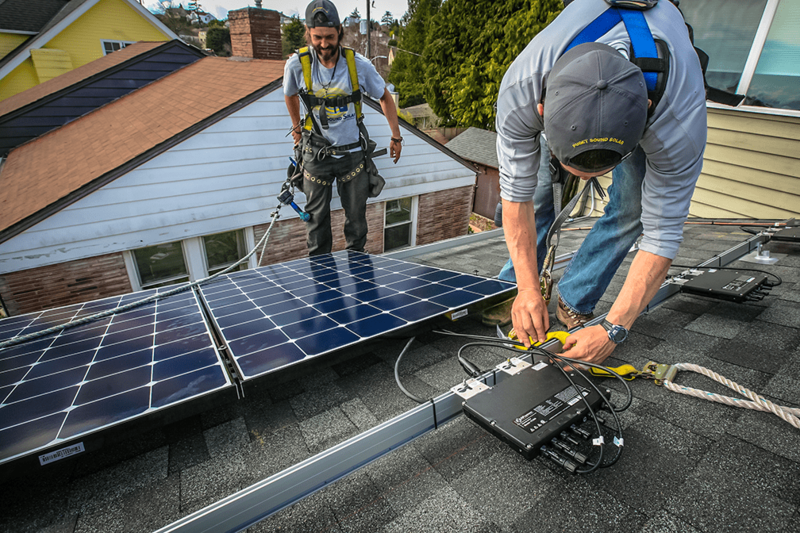 Do you use, specify, purchase, market or install solar inverter products? 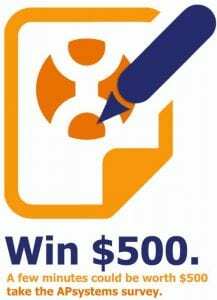 If yes then please take a few minutes to complete this survey, and you will be eligible to win a $500 Visa® gift card. It’s this easy: By answering all questions in the short survey, you’ll help us better understand customer needs and improve our products and services. The survey is completely anonymous, and any personal information is only gathered for prize notification purposes. 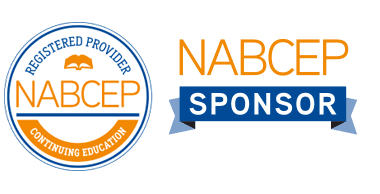 The survey closes June 30, 2018- please share your opinions today. To thank you for participating, we’ll enter you in a drawing for our prize – a Visa® gift card valued at $500. https://usa.apsystems.com/wp-content/uploads/2017/05/435802d5-8b9e-44ad-a3c7-97b88f92b4e5-1.jpg 800 579 APsystems Team https://usa.apsystems.com/wp-content/uploads/2018/05/apsystems-logo-300x92.jpg APsystems Team2018-05-18 21:37:402018-06-20 18:59:21Take our 2018 survey and enter to win $500 cash! 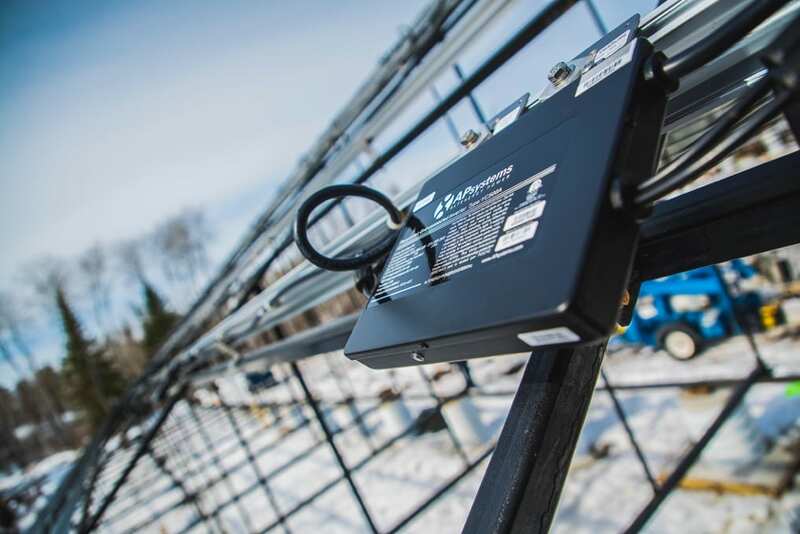 The largest solar array in Manitoba, Canada, goes live this month, powered by APsystems microinverters. 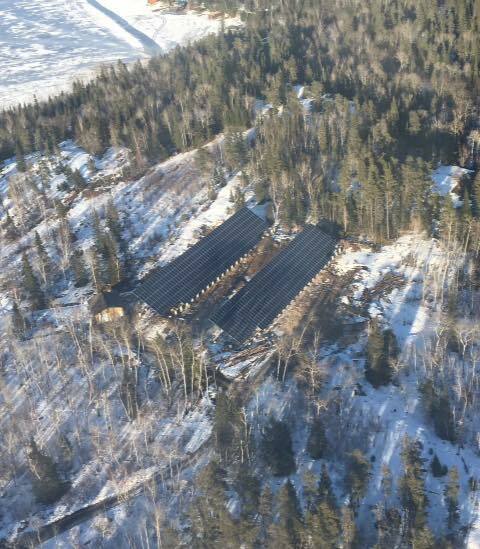 The ambitious 200.2 kW ground-mount array will provide 100 percent of the power needs for the Crescent Beach Cottages, a waterfront vacation resort on scenic West Hawk Lake in the Whiteshell Provincial Park. 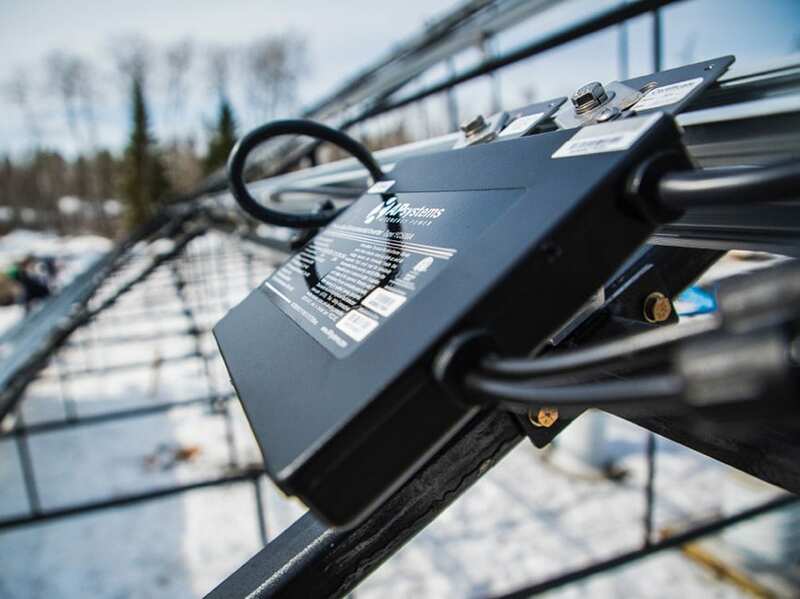 Installer Evolve Green of Manitoba and the resort owners chose APsystems YC500A dual-module microinverters for their high production and the integrated Energy Monitoring & Analysis system. The APsystems EMA allows real-time monitoring of individual modules in the array to ensure optimal production at all times. The resort’s rocky, forested terrain posed a challenge for installation – system designers had little room to work with – but creative placement put the topography to advantage. 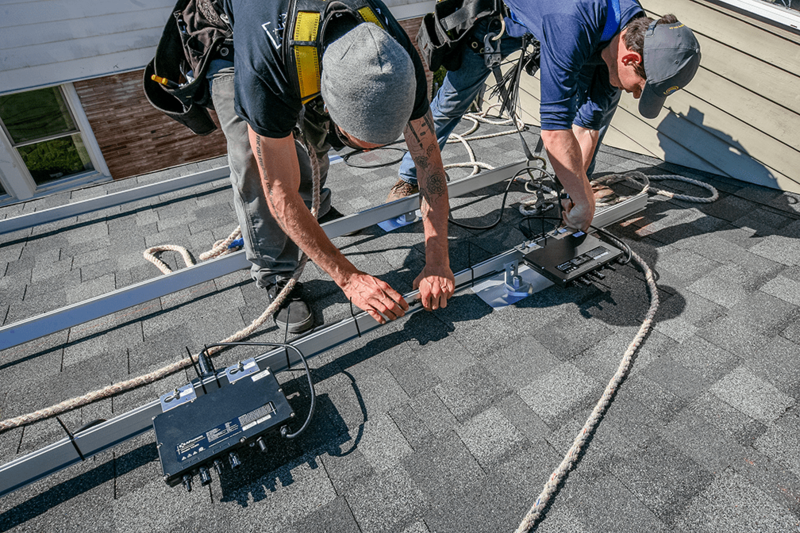 Installers mounted the second row of modules on a rocky tier some 8 feet above grade, allowing the two racks of modules to be placed closer together and conserve space. 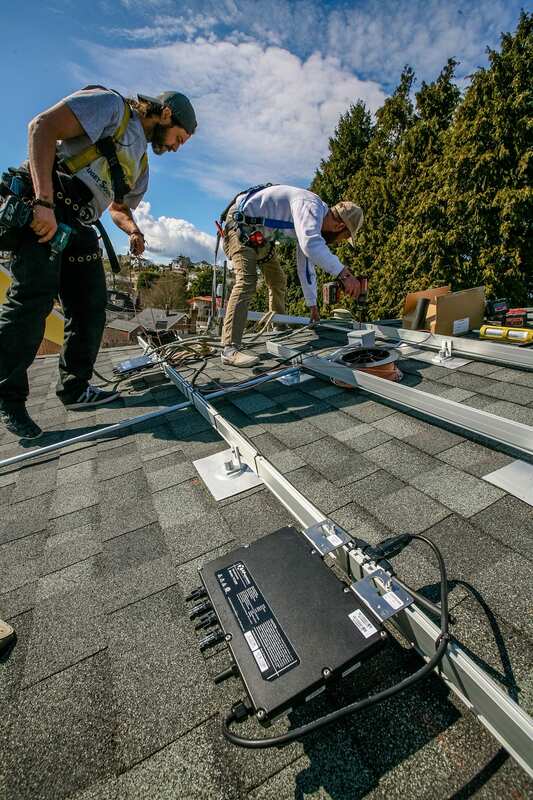 The two-rack ground-mount system includes 308 modules and 154 APsystems microinverter units per rack — more than 600 modules and 300 microinverters total — provided through Canadian solar equipment dealer National Solar Distributors. 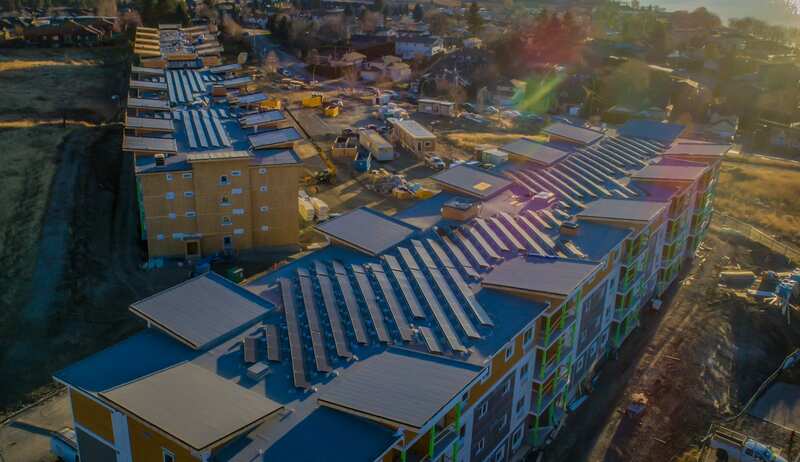 In addition to achieving “net zero” energy use for the resort, the owners will recover 30 percent of their investment through a rebate program by regional utility Manitoba Hydro. See a video of the Crescent Beach Cottages array here. 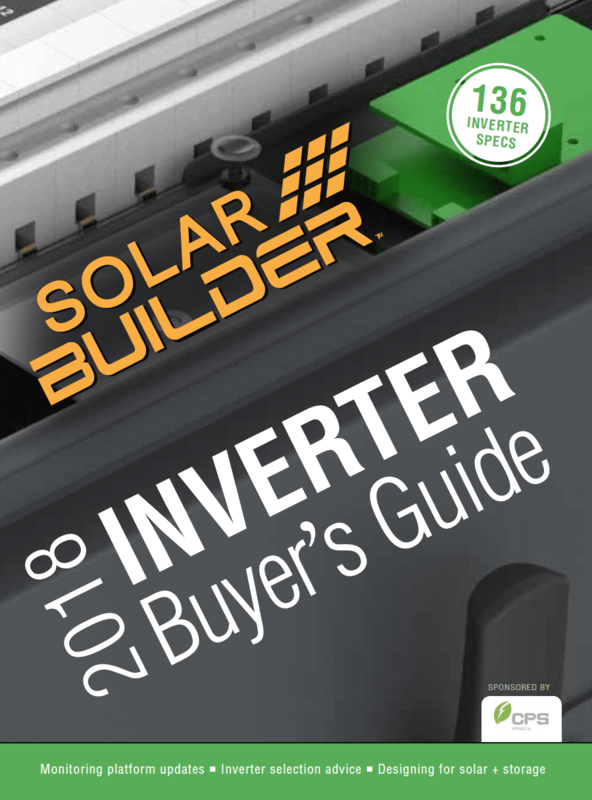 APsystems gets some great press in the new 2018 Inverter Buyers Guide from Solar Builder Mag, out now. The editors tout the new APsystems YC600 microinverter with Reactive Power Control and Rule 21 grid support functionality. Offering 300 VA peak output power per channel, the YC600 works with 60- and 72-cell PV modules and offers dual, independent MPPT per panel – setting a powerful new standard for microinverter technology. Download the 2018 Inverter Buyers Guide here. APsystems now offers the same, widely popular module-level monitoring features from its online EMA portal in its convenient mobile app. The EMA app displays solar array power production by day and month, as well as current panel-by-panel performance. 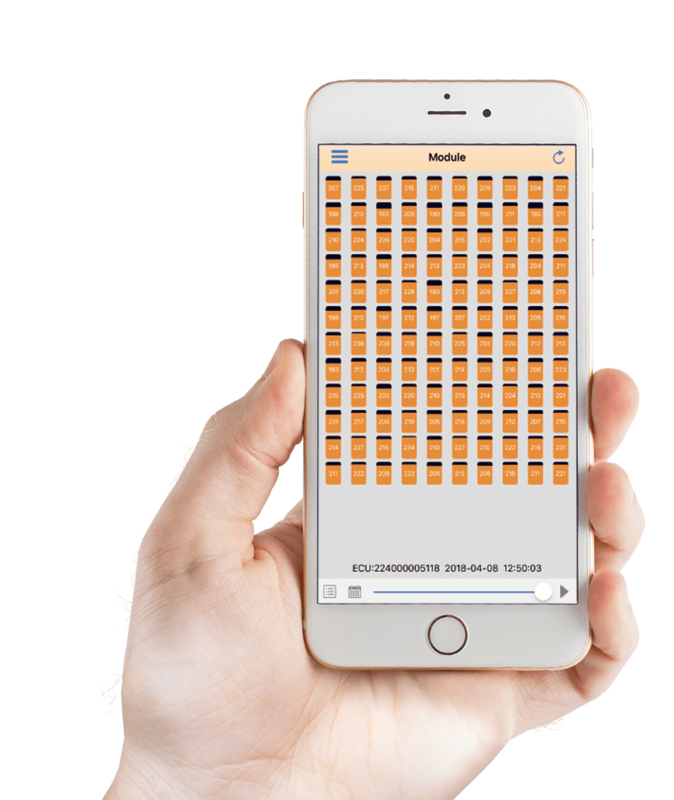 The app also features a date selection tool which displays module-level performance on a specific date and time for even more in-depth monitoring. In module view, users can select a specific module to view details, view a time-lapse or scrub through the timeline with their finger, and pinch the screen to zoom in or out. 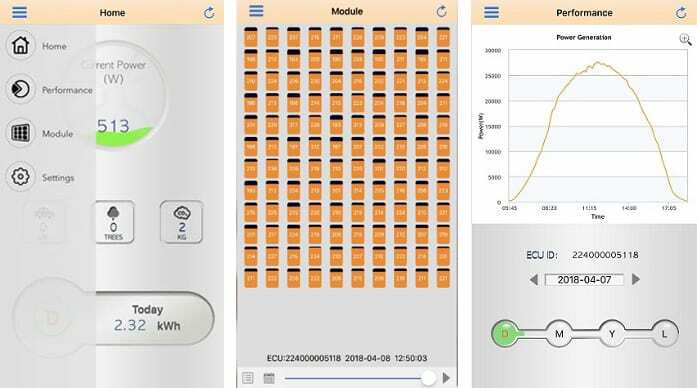 These new EMA app features offer solar system owners even more ways to monitor their system performance, troubleshoot issues and even showcase their energy independence to their friends! Find out more about APsystems mobile apps here. 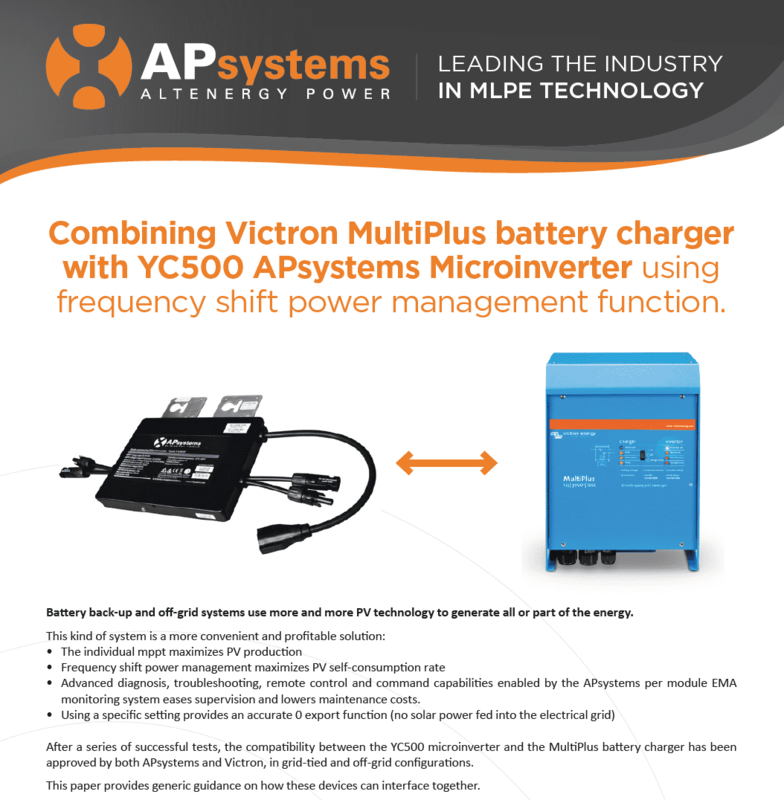 While APsystems microinverters remain compatible with a wide variety of storage solutions, our engineers took a look at a few microinverter firmware features which could enhance compatibility with storage solution components like Victron’s battery charger. Through a power output frequency shift, the charge controller is able to gradually ratchet the amount of solar energy provided to the batteries up or down, as opposed to a simple on/off operation, resulting in a smoother charging process and improved battery life. Click here to download the white paper.